Think of a medicine ball as kind of like a heavy basketball that may range in size from 4 inches to over 10 inches. Durable and varying in weight from 2 pounds up to as much as 70 pounds, medicine balls might be filled with air, rubber, gel, or even iron and have an outside covering made of materials like leather, rubber, vinyl, or thermoplastic. 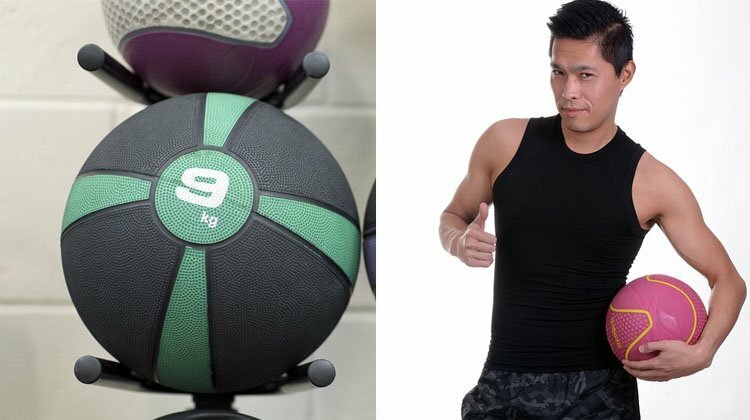 Wondering how to choose the best medicine ball? The weight and surface material you choose in a medicine ball will differ by your needs and abilities. For example, a rubber medicine ball might offer better grip than a thermoplastic one, and a vinyl gel-filled medicine ball might suit rehab needs better than a leather one used for abdominal work. Originally, medicine balls were just the rounded, heavy spheres you may have seen in the movies. Enhancements in design and engineering, however, mean that you can now find medicine balls with features like grip handles and attached ropes. Whether you are training for a sport you play, rehabilitating from a fitness injury, or simply incorporating medicine ball work into your exercise routine, there is definitely a medicine ball out there to fit your needs. What are the benefits of using a medicine ball? In addition to adding variety to your workout or training routine, using a medicine ball has specific athletic benefits that few other exercise tools offer. Medicine balls target a unique form of strength training that differs from free weight or dumbbell work. Instead of limiting your weight lifting to one plane of movement like you might with a deadlift, squat, or bench press, medicine balls help your body generate power through myriad planes of movement – up, down, front, back, around, behind – you get the idea. Depending on how you move the ball, you can build muscle tone and mass, speed train, enhance range of motion, and hone agility and balance skills via the median, frontal, and ventral planes, just to name a few! When discussing medicine balls, you may hear the term “explosive power training” thrown around, especially in the sports medicine world. This seemingly combustible term is actually referring to incredibly complex physiological and musculoskeletal abilities which come with training with a medicine ball. As the body adapts to moving the weight of the medicine ball around more efficiently and with greater agility, it trains the muscles to coordinate speed with strength, velocity, and force. Enhancing your maximum power output can potentially improve your athletic performance and allow for explosive bursts of power and strength. Chest pass – standing across from a partner (or a wall) feet shoulder-width apart, throw the ball back and forth, catching it at chest height with two hands, dipping into a short squat, and then projecting the ball back to your partner using the power from your legs as you resume a standing position. You can also do this pass lying down with your partner standing overhead. Behind the head pass – with your back turned toward your partner, hold the ball with both hands down towards your waist, squat, and then stand up and thrust the ball up and over your head directionally targeted towards your partner, using your legs for power and momentum. Twisting lunge – start with an athletic stance holding the medicine ball just a few inches from your chest. Dip into a deep lunge, extend your arms forward, and then rotate your torso and arms to the right and back again. Keep your thigh parallel to the floor and engage your core muscles as you twist. Medicine ball training boasts a safe, effective, and oftentimes fun way for athletes and workout gurus to condition, train, and rehab. Many athletic practices incorporate medicine ball work into their training regimen as well including tae kwon do. If you want to get started with medicine ball training, consult a knowledgeable instructor at your gym or sports medicine specialist.